Get this: In 2012, 391,000 books were self-published in the US alone. That number increased to more than 458,564 by 2013 (a 17% increase in self-published books year over year). If this pace continues (and it looks to), in 2015 there will be 1,728 books self-published daily, or about one book published every minute. How can your book stand out in such a competitive, super crowded marketplace? In other words, the people who succeed (in war, business, or life) are those who are able to do the hard, creative work other’s aren’t willing to do. If you pay attention to the book publishing space, it’s pretty clear that most authors are doing what most other authors are doing. Like the Sega Genesis game Lemmings, this is entertaining if you are in control, not so much fun if you’re following the guy in front of you right over a cliff. Thing Number 1: build an email list.  I’ve already explored this subject in detail here – The Author’s Guide to Building an Email List (and selling more books). Bottom line – authors with big email lists sell a LOT more books on average than authors with no email list. Thing Number 2: create a website that turns visitors into subscribers, loyal fans, and repeat customers. If you’re thinking “well dhur, Tom, that’s obvious – tell me something I don’t know ya turkey!” just look around at the majority of self-published authors; they either have no website, or they have a poorly designed website that actually diminishes their credibility (even if their books might be amazing). Worse still, most authors (even many bestselling authors with good looking websites) use their websites to send readers to their Amazon book sales page. I’ll explain why in a second, but first, to clarify – the key here isn’t a fancy looking website. Just because you can blow $10,000 on a new website doesn’t mean you should (or that anything will happen as a result). The success of an author’s website does not depend on money spent, but on thought put into the strategy and philosophy behind the website (which is what we’re focusing on today). CLV stands for Customer Lifetime Value (and is sometimes written customer LV, or LTV). CLV is an estimate of the revenue a customer will generate for your business during their lifetime. But when you send readers from your website to Amazon immediately, without asking for an email address, you lose out on the ability to stay in contact with them, and this minimizes your chance of a repeat customer (thus, CLV decreases, which is not a good thing). Sure, the reader might finish your book and might love it and might come back to your website, and might buy another book…but probably not. Most people see a website once and never return to it…unless there is a trigger that makes them go to it. A trigger is anything that initiates an action. The most powerful trigger you, as an author, can actually use, is email. But by sending people to Amazon, you lose out on getting the reader’s contact information (i.e. email address), which means you lose out on the ability to trigger an action in your reader in the future, which ultimately leads to fewer sales and a lower customer lifetime value. Getting an email address means you can initiate a trigger, which means more sales and a higher Customer Lifetime Value. Bottom line: if you want to make a living from your writing, you need to increase CLV, which means don’t send people immediately to Amazon from you website, but instead try to get permission to contact again via email. At this point, you understand the importance of building an email list…but how? Before we get to the design and execution of the website (which we’ll cover later), I want to focus on strategy, or how you should approach your author website in order to increase customer lifetime value. Step 1. Define the singular result you want from a website visit. What is your goal? What action do you want the visitor to take when he or she lands on your website? The best author websites aren’t chaotic and filled with links, and ads, and social media widgets, and other distractions, but are focused on a particular path they want the visitor to take, culminating ultimately in a choice they want the visitor to make (such as signing up for an email list to get a free book bonus). Now, while I have made the focus of this getting an email address from your reader, there is a time and a place to send people to your book sales page or other types of content. The point isn’t so much what the goal is, but that you’ve thought through it and been deliberate about how you design and setup your website because of it. Step 2. Outline the visitor flow. Now that you’ve decided your primary goal and the action you want visitors to take, you need to outline how they will reach this step and how they will take this action. The best way to do this is to draw or sketch out what happens when people land on your home page. 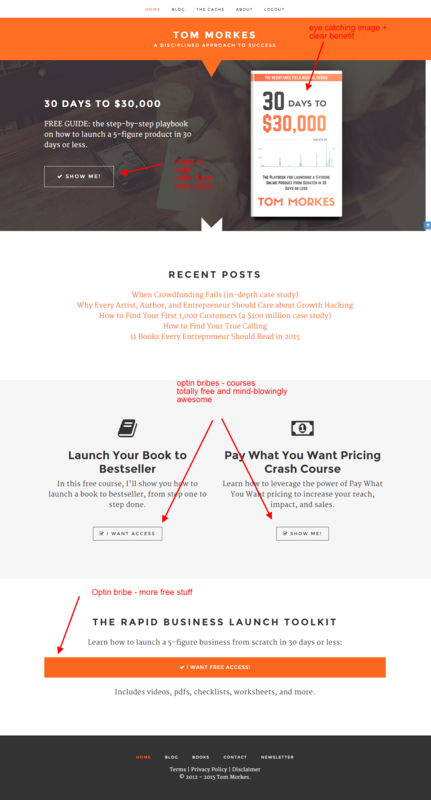 Is it clear what I should do when I land on your homepage? If I land on a blog post or another page, is it equally clear what I should do? Is it clear that there is only one action to take here? If there are many, does that take away from the goal? How many steps, clicks, or scrolling before I can sign up for your email list from any particular page or blog post? Step 3. Reduce and eliminate distractions. Anything that doesn’t lead your website visitor to the desired action you want him or her to take should be scrapped. Why do you need that widget? Why are you showing us your recent tweets? Why do I care how many Facebook fans you have? Do you really need X, Y, or Z? It’s not that any of these are wrong, per se, but you should only use them if they achieve the desired result you defined previously. Also note the fact that minimalist (read: less distracting) websites lead to higher conversion, which means by de-cluttering your website and focusing on your singular goal, you’ll increase subscribers, repeat customers, and loyal fans. #winning. I touched on book bonuses like free chapters and free courses in this article, and I we’ll touch on this subject again in the next section, so I won’t belabor the point here. This is good news because the design and structure of your website is almost 100% under your control. Is your message clear? 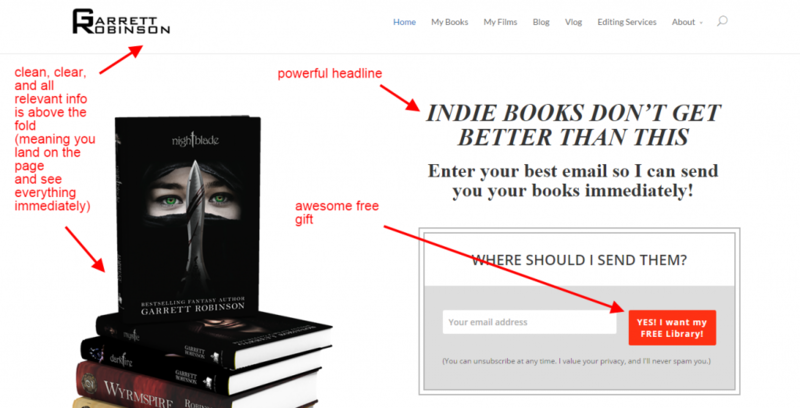 When I visit your website, do i know you’re an author and you write books in genre X or Y? Is there anything that would take away from this message? Clean landing page, great social proof, but email optin incentive can be improved. 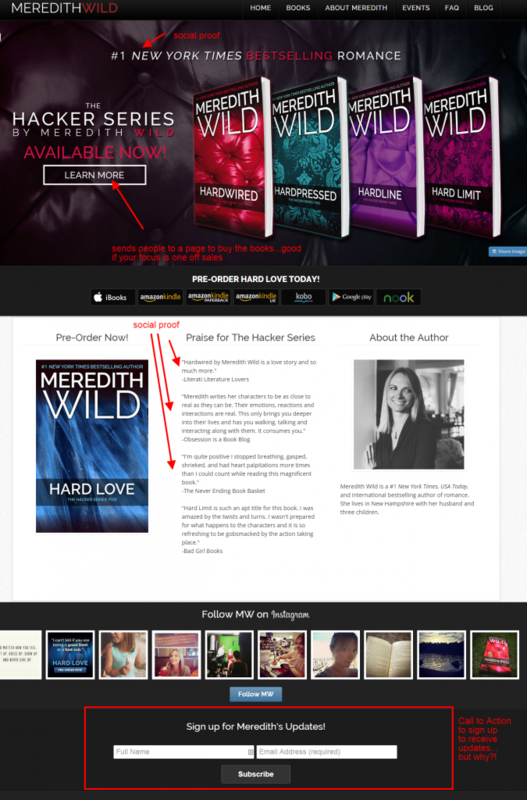 Meredith Wild is a bestselling fiction author. Her website has great design, looks sharp, and sets the tone for her novels. Everything is great design-wise, but she misses the opportunity to get readers to sign up to her email list (the images at the top send people to Amazon to buy the book… *head slap*). This could be easily improved by changing the message at the top to encourage visitors to sign up to get one of her bestselling books for free (or for a discount, or using a free chapter, etc.). She might lose out on an immediate sale, but again – CLV is what we care about. In addition, her website could be improved by updating her call to action at the bottom of the page. The current incentive says: “Sign up for Meredith’s Updates.” But why should I? What does an update look like? What’s in it for me? Always consider these questions as you build out your author website. Is your website devoid of distractions like unnecessary widgets, twitter feeds, etc? Does your website fee professional or does it look like an amateur hack-job? Of the few images you use, are they high-quality and do they lend credibility to your work? Garrett Robinson, bestselling fiction author, has a clean website and great offer “get your free library.” This free gift is very compelling – much better than giving away a free chapter of the book. Garrett also has one of the cleanest looking layouts I’ve seen of any fiction author. The presentation is spot on and makes me trust him as an author. Can I figure out what you write about in two sentences or less? If you’re showing me a book, do I know what it’s about in less than three bullet points (not a hard and fast rule, but less is almost always more)? When I visit your website, what makes me want to stick around? Why would I want to dig deeper into what you write? Why should I ever come back to your website? 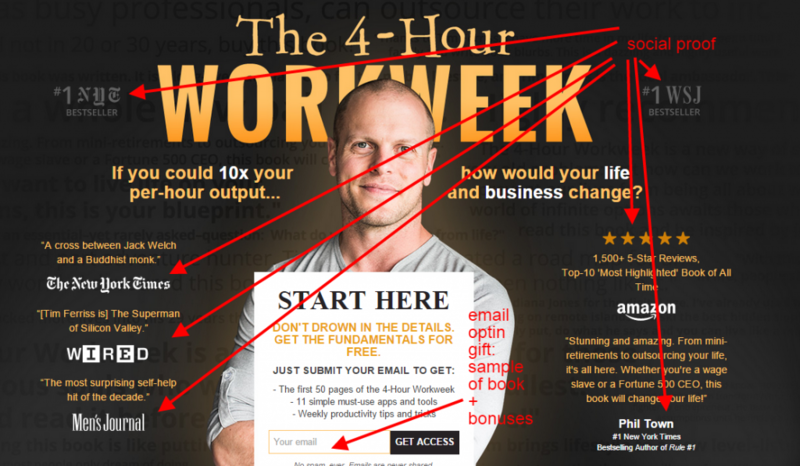 Tim Ferriss is King Dingaling of Social Proof. Tim Ferriss is the bestselling author of the 4 Hour series. His home page is designed for one purpose – to get you to sign up for his email list. Tim does this by overwhelming you with social proof – just look at all the big names and publications saying kind words about his books. This is proof that you too should sign up for his email list, or otherwise miss out on something that many others seem to enjoy. Anything that adds to your social proof (reviews, testimonials, logos of big publications that have referenced your work, etc.) will add to the credibility of your message and make your website (and newsletter) more compelling. From the moment I land on your website, is it simple and easy for me to take the action you want me to take? If you want to build your email list, is there a clear optin at the top of the home page? At the bottom of blog posts? On your about page? Is it easy for me to sign up? Is there an incentive for me to take this action (i.e. a book bonus, free gift, etc.)? 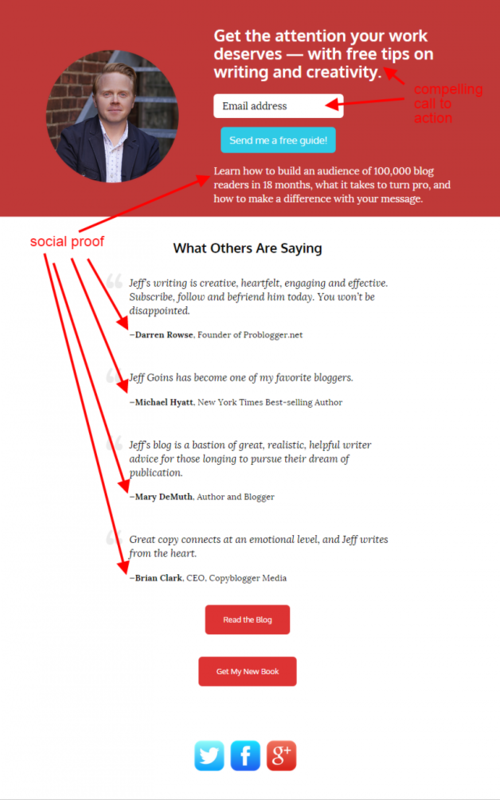 Jeff Goins has a clean, simple home page with great social proof. Like Tim, there’s a lot of social proof on Jeff Goin’s homepage, and there’s only one or two actions you can take – sign up or go to the blog. It doesn’t get more focused than that. Note: If you don’t have as much social proof to dish out as Jeff or Tim, consider highlighting the benefits to signing up for your list (either through your free gift optin incentive, or why signing up will improve the life of the person signing up). Because I’ve been attempting to build an Author’s platform for several years, I have gone through many iterations of my website, slowly but surely improving it along the way. I want to show you the changes that have been made so you can get an idea of how I’ve learned over time and why I’ve changed up what I have (so you can start two years faster). My very rough optin bribe in 2013. So at that time, I had approximately zero followers, unless you include me signing up for my own newsletter (if I won’t, who will)? This type of design and offer is weak. Who cares about my book? And what does signing up even mean? Does it mean blog posts once a day? Once a week? A podcast? Not very clear – and one of the reasons it took me six months to get 150 subscribers. My optin incentive in 2014…better, but not great. With this design, I made my home page a single optin page. It could be skipped by signing up or by scrolling down. This increased sign ups, but it was still a weak incentive. Why would people want exclusive, weekly updates? About what? Who even cares who I am? Even though it was weak, this optin page helped me reach over 1,000 subscribers, so it definitely works better than the alternative. You can create a similar optin home page using Sumome (free plugin for WordPress and works with non-Wordpress websites as well). I stuck with this type of website for a while before finally investing in www.newrainmaker.com to build a proper author’s platform. My new home page with plenty of places to sign up. Notice that essentially everything on my website rewards people for signing up. 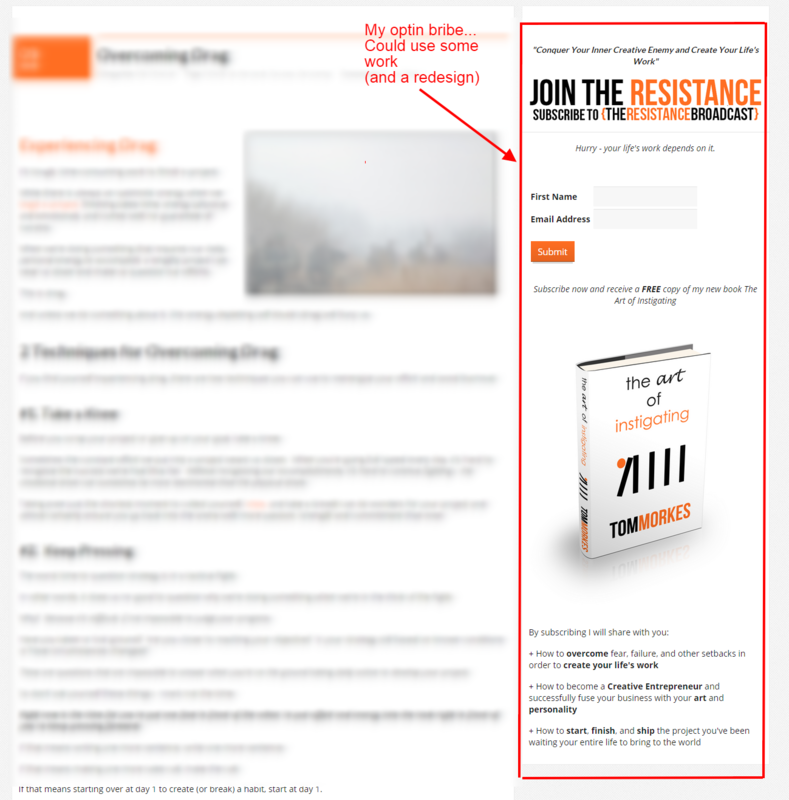 Even my blog posts, if you click through them, provide blog-post-specific bonuses for those who choose to subscribe. I recently offered a group of self-published authors the opportunity to have me evaluate their websites and offer feedback on how they can improve their websites to turn more visitors into subscribers and repeat buyers. I’m adding them here as I create them, so check back soon for more. Let me know in the comments below your biggest takeaway from today’s lesson. Tom, thanks for sharing this valuable information. These are the specific guidelines I need for rebuilding my website in preparation for my book publishing. Once I try my hand at implementing these steps, I’ll ask for a three minute eval. Biggest Takeaway: Hard to walk away with just one, but I really like how the 4 steps and 5 C’s make optimizing your author website SIMPLE. I can go through 9 simple steps and optimize my website. Thanks! I recently re-did and am re-doing my website by modeling Dan Norris’ site for Content Machine. I’m still waiting on a few elements I need to add in, but I believe this is the best rendition of my site so far. I’ll be sending traffic to it today to see if my belief is correct. I’ll also be going through the 4 steps and 5 C’s. I think the biggest takeaway from this was making the page as simple as possible to direct visitors exactly where you want them to go. Love the checklist type formula and the examples! Bingo – simple is key. Thanks Darryl! Hi Tom, found you through Pat’s Kindle group. Nice to connect with you. Thank you for all the valuable and concise easy to use info. I personally find it difficult to keep my website viewer on track, and suffer from “here have everything, all at once!” syndrome. Tom, biggest takeaway – importance of building the email list. Great advice. I love your detailed feedback and suggestions. Thank you so much. Time to start making updates. my pleasure Eder – glad you liked it! I also read your previous post, The Author’s Guide to Building an Email List. I’m still having trouble understanding how you got visitors to your site in the first place, before you get them to sign up to your email list. The previous article mentions 1) creating content, 2) making it “viral,” and 3) guest post and podcasting. As far as I can tell, just creating content or having a few people share your post on Twitter is difficult to attract major traffic. I think guest posting can definitely help a lot, but you say it will take months or years to build a relationship and guest post. What are you supposed to do in the meantime? So I’m wondering what YOUR process was to build this blog. I’m mainly interested in your guest posting process. Could you elaborate on that? Thanks Tom! Brian, this is such a good question it deserves its own blog post…I’m making a note and writing it now. I’ll shoot you an email when it’s finished and posted (give me a couple weeks – I want to be comprehensive). Did you ever write this blog post? If so, what’s the link to it? No, I never did write a blog post about my guest posting process, per se. But I did write a book that discusses the strategy I use to leverage other people’s audiences into traffic, leads, and sales for my business. The blog post about guest posting. Brian wanted to know what was your process in building your blog, guest posting, most specifically. Thanks. Informative website, BTW. I tried posting a reply but I don’t think it went through…I had said, The blog post about guest posting. Brian wanted to know your process in building your blog, most specifically, guest posting. Thanks. Informative website, by the way. Wow. Not only is your content in this post great, but the flow of information is extensive. As a techie marketing professional turned wellness author, this gives me a lot of amazing ideas as I head to the drawing board to market my own stuff for a change. Thanks for the inspiration, and to the Facebook share I followed to get to this link! This videos are not working anymore. Thanks for the update; just fixed the youtube video settings; should be able to see everything now!